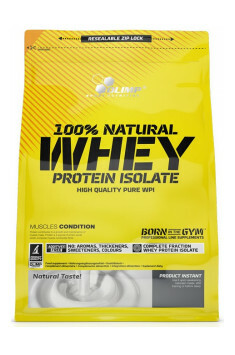 100% Natural Whey Protein Isolate by Olimp Sport Nutrition is a dietary supplement in the form of high-quality whey protein isolate. The product was obtained in the process of cross-flow microfiltration (CFM), thanks to which it contains a great amount of easily assimilable protein (BV=159). The company Olimp Sport Nutrition provides whey protein isolate complying with pharmaceutical standards, free of any sweeteners or flavouring substances. Thanks to that, the product is a great option for people who have low tolerance to that type of additives. What is whey protein and what are its functions? Whey protein is a product obtained during cheese production. With proper processing, it is possible to obtain whey protein concentrate (WPC) from it, which has a very beneficial amino acid profile. It constitutes a great solution that helps to supplement protein deficiency in the diet. Maintaining proper protein supply helps to increase muscle protein synthesis. It stems from the fact that the amino acids released from whey protein during the process of digestion constitute a structural element of muscle proteins. Supplementing amino acids in the form of cysteine and branched-chain amino acids (BCAA) provides additional benefits for health. Cysteine is a sulphur-containing amino acid important for the right synthesis of glutathione. It is a peptide with antioxidant properties that exhibits a natural ability to eliminate free radicals. Thanks to that, it reduces their negative effect on the functioning of the immune system and the entire organism. The high content of branched-chain amino acids efficiently helps to reduce the feeling of tiredness after workout. Moreover, the human organism cannot synthesise them by itself, so their proper supply with food and supplements help to support the normal functioning of the organism. Whey protein isolate is a product obtained through WPC microfiltration. Thanks to that, the amount of fats and carbohydrates is reduced, which significantly improves digestion and protein absorption. The isolate contains a large amount of branched-chain amino acids in the form of: leucine, isoleucine, and valine. Moreover, the supplement contains a complex of exogenous amino acids that cannot be synthesised by the organism. BCAAs help to reduce muscle pain after workout and make it possible to supplement amino acid deficiency in the diet. It is particularly important to ensure a proper supply of leucine, as it has an important role in the synthesis of muscle proteins. The supplement 100% Natural Whey Protein Isolate is a high-quality protein supplement intended for physically active people who want to develop their muscle mass. Additionally, it constitutes a great option for people who do not have time to eat the right amount of protein. The form of whey protein isolate guarantees 100% purity of the preparation, thanks to which it does not contain any substances with allergenic or harmful effects (like lactose). 100% whey protein isolate (from milk) (contains lecithin (from soy)).